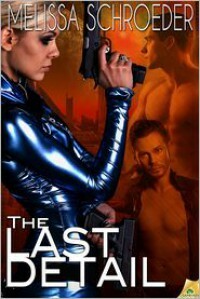 The Last Detail was a fun, steamy read with lots of action around every corner. I had this read in almost one sitting. I stayed up late to finish reading it because I had to find out what happened next! Melissa Schroeder knows how to write characters you care deeply about in a short amount of time. This is my favorite of the books I have read by her. Lou is such a great heroine. She's feisty, bossy and not afraid to do what needs to be done in order to get her ticket back to earth. Her last job as a bounty hunter is to go after Sam Dawson, and after she is able to lure him out of the bar she finds him in is surprised when they come back to that area to see the said bar blown to pieces and all sorts of bounty hunters in the area to get Sam. She immediately senses something is up and gets the heck out of dodge to the safe house her boss, and the only constant guy and friend in her life has told her to go if things get dicey. On the way to the house there is a lot of action and Sam realizes that Lou is his safest bet. At the safe house the two give into their feelings. Most of the time I have a hard time with novellas where the couple has only known each other a few hours or days and then suddenly is in love but this time it worked...maybe because both admitted it was passion and the caring for each other came later. The part of the Sam/Lou relationship is Jared, Lou's boss. He realizes right after he sent Lou after Sam that something wasn't right about this bounty. Too many things don't add up, and he immediately think it's a trap & leaves to try to stop Lou from going after Sam. Jared arrives on the planet and sees the mess the city is in and immediately heads up to the safe house. The relationship between the three is a little complicated, but I don't want to say why and ruin the surprise of why it's complicated. Lets just say it works and surprised me more then it probably should have. I just loved the different dynamics that the three had with each other-separately and together. The pov changes from character to character, and instead of being confusing it works. I enjoyed it because it made me feel like I got to really know each character that much better. The world building was done in such a way that I immediately felt like I was living on Arcardia. It was different enough not to be earth, but not so different that I spent half the novella trying to figure creature was what. Don't let the sci fi setting scare you from reading it! The Last Detail was a refreshing hot, steamy did I mention it was super hot read, and I hope there are more stories set in this world!